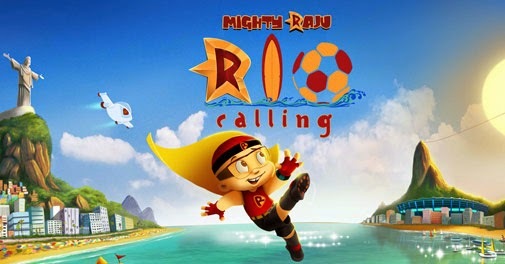 Google+ bangalorebengaluru: movie promo : Animation movie "Mighty Raju Rio Calling"
movie promo : Animation movie "Mighty Raju Rio Calling"
“Mighty Raju” is a popular TV movie series on Pogo India TV. As its ratings were so good, the creators [Green Gold Animation Pvt.Ltd] of India’s favorite kids’ character Chhota Bheem scheduled to release their third theatrical movie titled “Mighty Raju Rio Calling” in mid May 2014. This is a 2D Animated Film based in Rio De Janeiro, and its a blend of Sports, Action & Superhero Masala. This movie is not just for the kids, but for all ages who have fantasies and dreams to be heroic and experience the thrill of adventure. Extensive research was done in Rio de Janeiro and most of the music recordings were done there to capture the sights and sounds. Sunidhi Chauhan has sung the title song for the film. The audio has 9 tracks, which includes 1 track from the TV series. 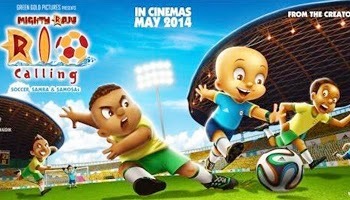 The tagline of the film is ‘Soccer, Samba and Samosas’ and the story is based on soccer and set in Rio de Janeiro, Brazil. Being released in Hindi at about 300 screens across India. Mighty Raju, is a four year old kid and has super powers. He travels to Rio, Brazil as his father Swamy has been given a special assignment by the government of India. Raju is very skeptical and feels that he will miss all his friends. Soon he begins to like Rio and joins a school over there, but gets bullied by Daniel at the school and gets teased that he doesn’t know anything about or how to play football. Raju meets Maria and befriends her. He comes to know that she is the daughter of the Don of Rio- Don Pedro. Raju begins to experience strange phenomenon and keeps losing his super powers for short durations of time. Meanwhile, his dad is trying to solve the puzzle of banks in Rio being robbed by the means of computers. Eventually, Mighty Raju learns to play football and his school team reaches the final of the inter-school tournament. In this film all his wits and powers are put to the test in a pulse-racing face-off against nasty soccer rivals, gun-toting Mafia dons and deadly Capoeira fighters, all set out to strike him down. Will Mighty Raju emerge victorious?. Mighty Raju today has become a much loved character for children on television. Moby (Raju’s Pet), Cheeky (Raju’s Robot), Julie, Swamy( Raju’s Father), Sandhya (Raju’sMother), Karati (Evil Scientist) who are the key characters of Mighty Raju TV movies will feature alongside additional characters such as Daniel, Lucas, Maria and Don Pedro in the film. Merchandise is also launched that includes Action Figures, Apparel, Stationery, Games and Toys, which are available in 30 Green Gold Stores and online across India. 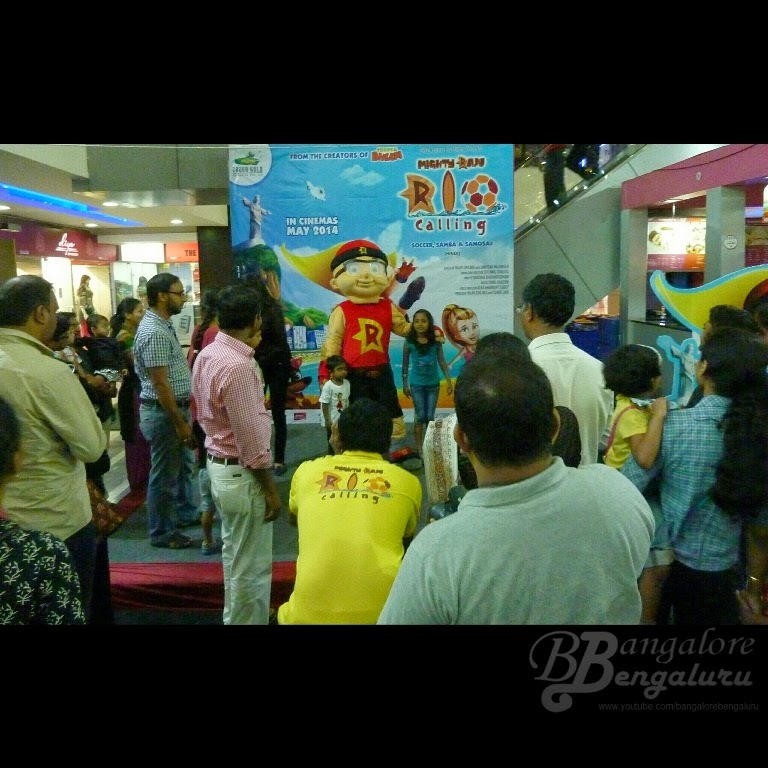 Mighty Raju was very busy promoting his film "Rio Calling" in Bengaluru city. The kids had a lot of fun playing the games and wining loads of prizes. They were very excited to meet Mighty Raju in person and got a change to take pictures along with him. Have you seen this movie?. Share your thoughts.. I no longer post in BangaloreBengaluruBlog.Blogspot.in I have relocated to a new URL, I currently post only in my website LifeThoughtsCamera.com. That's is guys. Don't forget to share/like this post now :-). You will find the buttons below the post. Is it tough to do a good deed? its new : SAMSUNG launches "Galaxy S5"